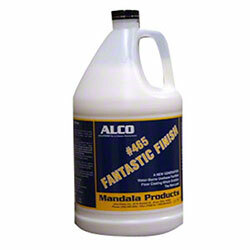 Alco Fantastic Finish - Alco-Chem, Inc. Brilliant long lasting floor finish. Our best finish that responds to spray buffing to retain the superior initial gloss. Clear, non-yellow formula that resists dirt penetration and ideal for propane burnishing. Fortified with urethane.